I’ve been on hiatus with Progressive Eats for a couple of months now. But no longer! Today, I’m back and am thrilled to be participating in Heather’s from All Roads Lead to the Kitchen Tea Party. All our dishes are made with tea. Fun! I made some Southern Sweet Tea Roasted Corn on the Cob, and man is it good! Check out this line-up of tea-infused goodness, you guys! Everything sounds great, right? 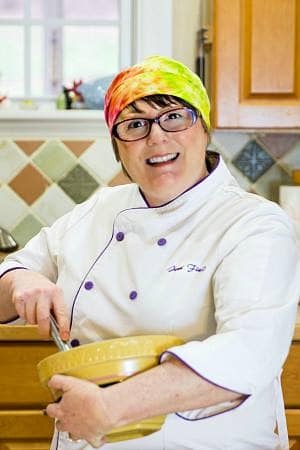 I know I can’t wait to wander through everyone’s posts and get inspired to do more cooking (and smoking!) with tea. And now, on to the Sweet Tea Roasted Corn. You guys are really going to enjoy it. Leave some of the inner leaves on your ears of corn, peel them back, and clean off all the silk. You can hold onto the stem end and the leaves, or do what I did for serving: tie a cloth napkin around each end. An easy-to-make, 3-ingredient glaze is all you need to up the flavor in your corn on the cob. Make these on the grill or in the oven. I roasted mine at 375F for 25 minutes, turning once. Let me show you how easy these guys are to make. 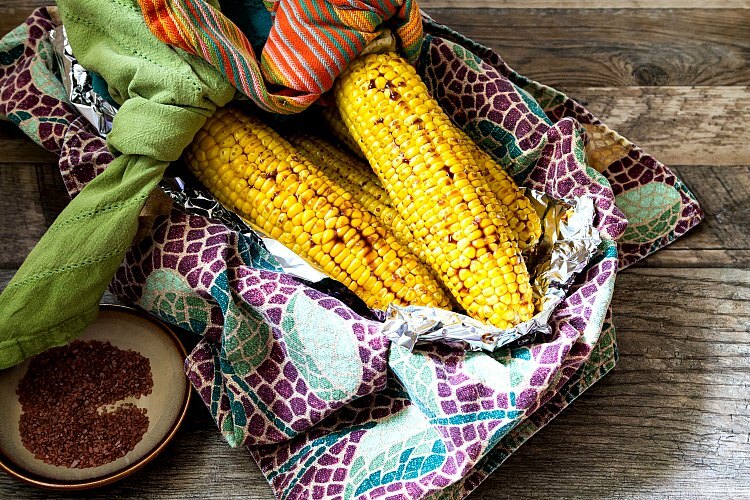 This Southern Sweet Tea Roasted Corn tastes just like summer in the south. Easy to make and even easier to eat, add some extra "southern" to your next picnic or tailgating! Combine all ingredients in a small sauce pan. Bring to a boil and reduce by half. (I did this by weight. The ingredients weighed 10.5 oz, so I reduced until I had right around 5 oz of liquid). Cool to room temperature. Shuck (leave some leaves on for serving) and clean corn of silk. Line a pan with parchment or foil. 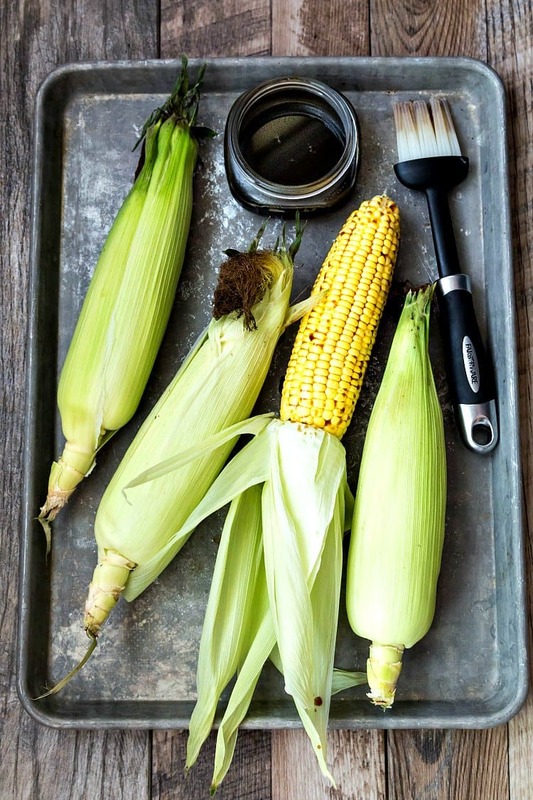 Brush the ears of corn all over with the glaze and season all over with kosher (or other) salt. Place on the baking sheet and roast for 10 minutes. Meanwhile, reduce the remaining glaze down to a very thick syrup. Be careful, because it can burn wihen the sugars get really concentrated. You're looking for about the consistency of sweetened condensed milk. Take the corn out of the oven, brush any glaze that has run onto the pan back onto the corn. Turn the ears over and continue roasting for another 15 minutes. You may need to cover the loose leaves (if you left any) with some foil to prevent them from burning. 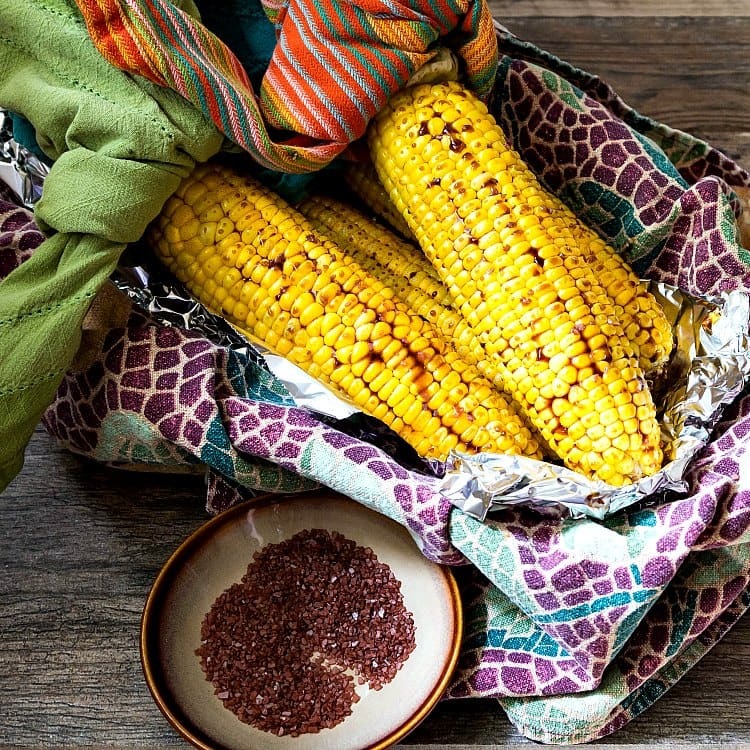 Once the corn is finished, brush each ear with some of the thickened glaze and sprinkle with kosher salt or finishing salt of your choice. 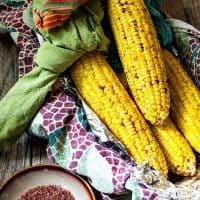 Here are my recommendations for equipment and ingredients you can use when you make Sweet Tea Roasted Corn. The half sheet pan won’t warp–so that’s an excellent thing. Note I couldn’t find the exact tea bags to show you in the shopping widget, but here’s a direct (affiliate) link to the Luzianne tea bags I used. Not that I expect you to buy 12 boxes–just so you can see what I used! Thank you for supporting PCO by shopping through my affiliate links. I truly appreciate it. And there you have it, you guys. Southern Sweet Tea Roasted Corn. It might become your new favorite! Extra good news? The flavor is so good, you may decide it doesn’t need butter. But I won’t tell if you decide to use some anyway. Enjoy! Thanks for spending some time with me today, friends. Take care, and have a lovely day. What a fabulous way to use tea. I was so interested in this from the moment I saw your title yesterday. LOVE this! Thank you, Susan! I had a vague idea about using “some sort of vegetables” with “some sort of tea glaze,” but when I saw the corn in the store, I knew exactly what I was going to do! How cute is your website!! And GORGEOUS photos!! And I want that corn!! Thank you, Anshie! I love it–Charissa did a wonderful job on the site! Plus: I took the photos on a super rainy, dreary day, which is my favorite. 🙂 And: delicious. It seriously is really good. Would probably be good using other veggies as well. I am so happy to be back doing PE again–I missed you! 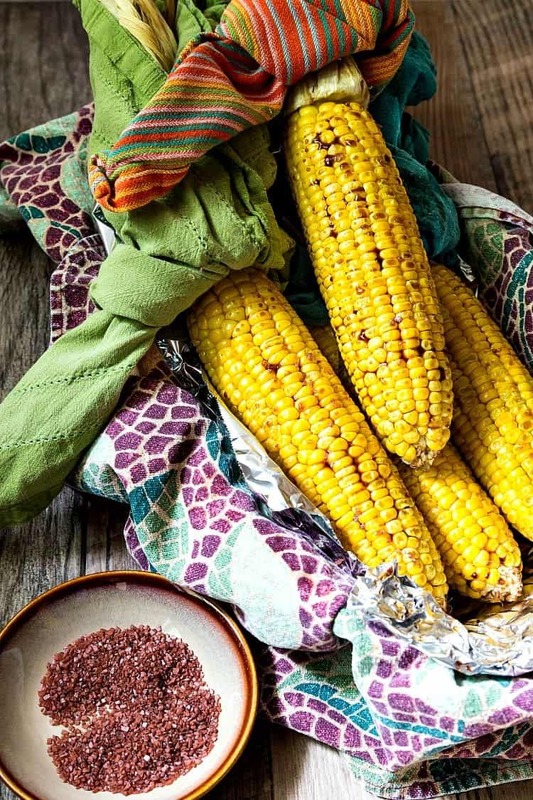 As is typical of the land where I live; it is now raining with a forecast of it turning to snow, so reading about a summer dish helps me to remember that a day like this is fleeting and warmth will return again soon along with barbecues and delicious corn on the cob. What a great southern combination…and even better? EASY!! I can’t try it for awhile; corn in Colorado isn’t worth buying until mid summer, but I can imagine a lazy evening with corn and sweet tea and nothing else for dinner. Heaven. What a great new way to enjoy corn on the cob Jenni! I cannot wait to try this with your sweet tea and soy sauce! The flavor must be incredible. So glad your site is back up and running again – and beautiful new design! Brava my friend!! We love corn on the cob and your tea glaze is a yummy way to shake up our plain ol’ butter routine!! Your blog looks fabulous!!! Thank you, Liz! I’m so happy with my site. 🙂 I hope you love the corn! As soon as I can get my hands on some really good corn, I’m making this! What a simple and delicious way to amp up the flavor.